I just received my doll as a freebie from an Ebay seller. I purchased two small dolls from her. Then, she was bedridden with the flu and didn't get out of bed until Sunday. When she shipped the dolls I purchased, she included this extra doll to make up for the delay in shipping. 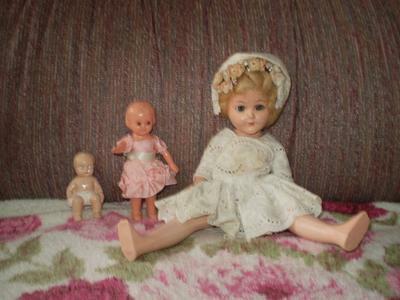 (She lives in Western Indiana and traveled to an estate sale of a collector in Kentucky, where she purchased a number of dolls). I found the A & H logo on the back of the doll. She is 10-1/2 inches tall. Comments for Unidentified A & H Doll of Destiny? A Donna Doll! Thank you for responding! I got the doll free. I bought another doll and the seller included this doll (in pieces) hoping I could put her back together! She is now proudly displayed! Yes that was the "Donna Doll" that my dad named after me. So funny to find this. I don't even have one myself so it was nice seeing it listed. I believe this is one of A & H Doll Company's Donna Dolls. They were this size and came out just before the Dolls of Destiny. Essentially, they were the same doll. Join in and write your own page! It's easy to do. How? Simply click here to return to DOLLS OF DESTINY.